The Sevenoaks 7 (also known as the 7oaks7) is a seven mile race through Knole Park, the stunning deer park that surrounds Knole House in Sevenoaks, Kent. It is hosted by Sevenoaks Athletics Club and this year was the 23rd edition. It took place on the August bank holiday Monday. It's not the first time I have raced in Knole Park, in fact my first ever 10k race was run here and I returned to that race a few years later to see how much I had improved. However it was the first time I had run this particular race. 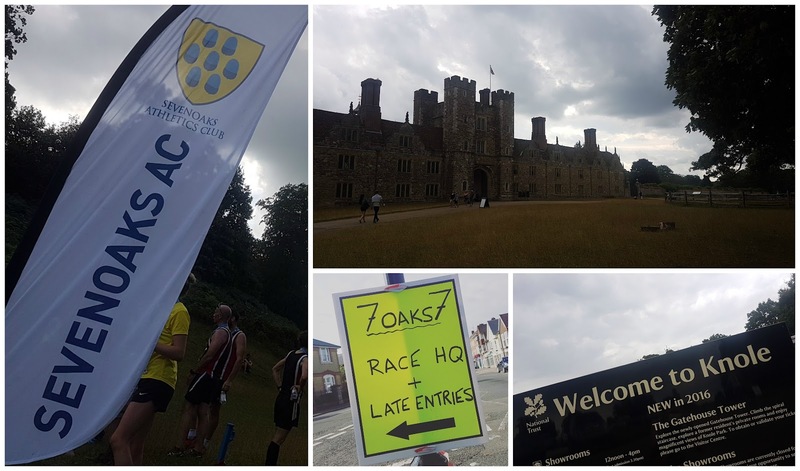 The race HQ was at Sevenoaks Rugby Club which is about a 10 minute walk from the start-finish area of the race. 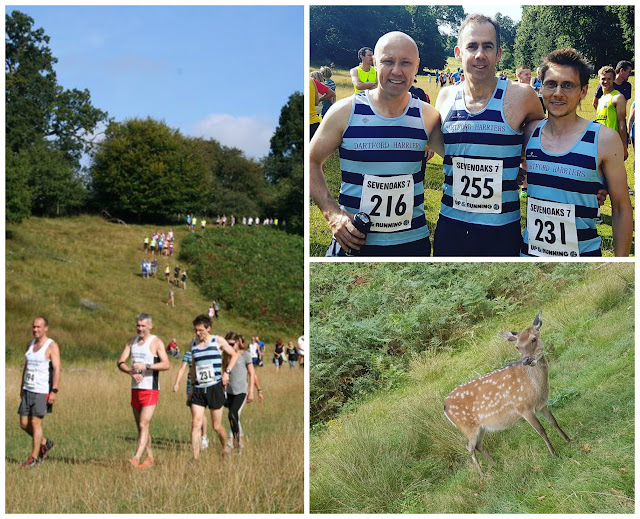 I entered this race on-the-day and my lack of planning meant I had to pay a £15 entry fee. Had I been more organised and entered in advance I would have paid the very reasonable £11 affiliated runners fee. Unaffiliated runners would have paid £13 in advance. For early arrivals parking was available at the rugby club. However the car park here isn't big enough for all entrants so extra parking was available free-of-charge at the near-by leisure centre. Toilets were available for use inside the rugby club clubhouse as were refreshments including tea, coffee and cake. I bumped into quite a few people that I know from the fantastic local running community and I always enjoy these pre-race chats. 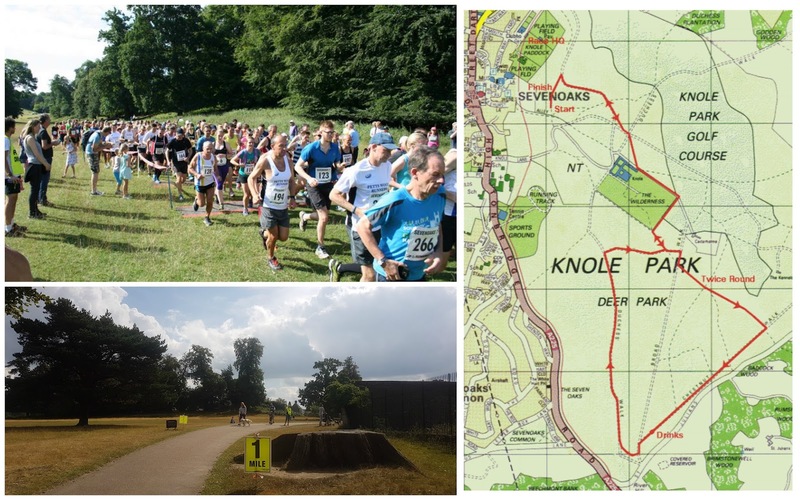 The race itself started at 10.30am in the valley on the north-eastern side of Knole Park, not far from the footpath that leads directly from the rugby club into Knole. After quite an amusing welcome speech and briefing the runners were sent on their way. With the race taking place in the summer after a long period of dry weather, I decided to wear my light trail shoes, but road shoes would have done the job. It was the first time I had entered a seven mile race. To be honest I think it's the only one I've ever heard of. 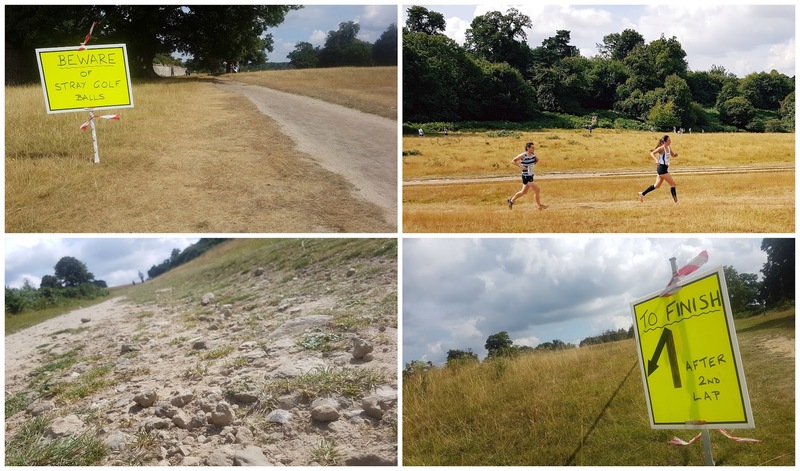 The course was run over mixed terrain with a split of approximately 4.3 miles (7km) on grass or dirt paths and the remaining 2.6 miles (4.2km) on tarmac or gravel paths. The course can be described as very undulating or probably more accurately as 'hilly' and it's certainly a challenge. The course is made up of a 2km tail, followed by two clockwise loops and then the runners return to the start-finish via the tail. 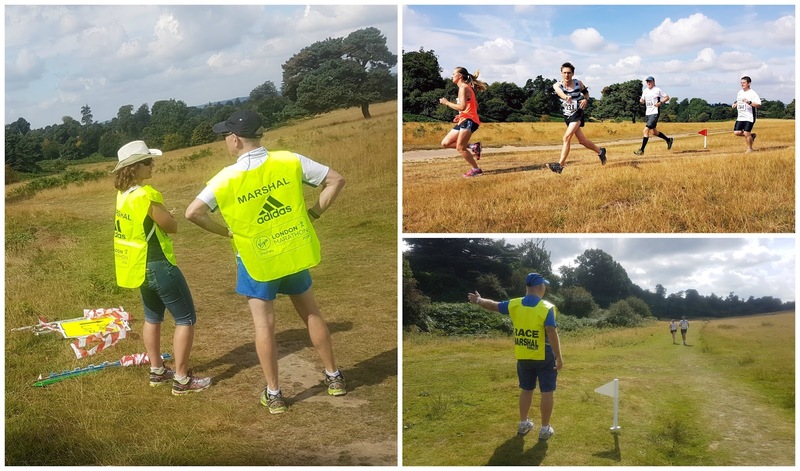 The first four kilometres are almost totally uphill, at which point there is a very steep downhill that takes runners down into the valley. This section is ever-so-slightly downhill and allows the runners to open up and get their pace up. The steepest section of the course comes at the end of the valley and is a 400 metre slog up to the end of the loop. It's generally around a 6% incline but my GPS data registered a couple of points where it hit double figures. After the second loop is complete it's time to head back to the start-finish, and the remaining two kilometres is largely, although not completely, downhill. At the end of the race, bespoke 'Sevenoaks 7' medals were given out by double gold winning Olympian Dame Kelly Holmes. The timing was done by chip which was embedded into the back of the race numbers and the official results were online later that day. I got around the course in a chip time of 51.40 (gun time 51.48) and was the 45th runner out of 257 to cross the line. All in all this was a really enjoyable race and I am pretty certain that I put in the best performance I could possibly have done given my current fitness level. 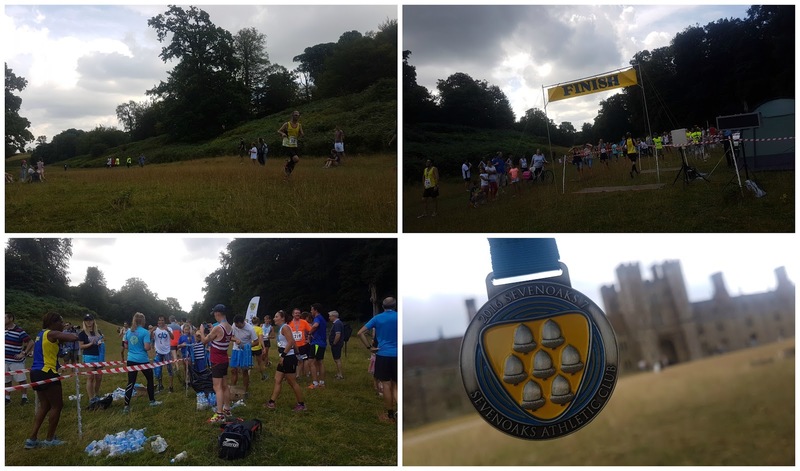 My kilometre splits were all over the place, but that's to be expected on a course like this. However my two 3.6km 'Sevenoaks 7' loops (see my Strava segments) were run with only an 8 second difference so I think I got my pacing spot on.